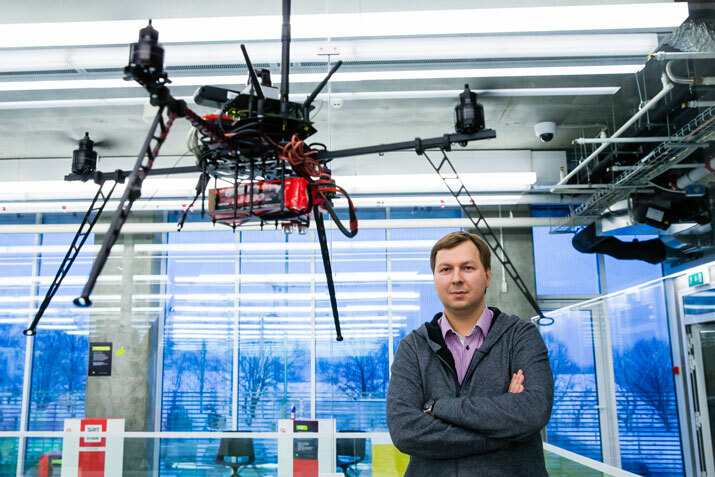 As part of our series on high-risk, high-reward robotics, and as a follow-up to his recent Robot’s Podcast interview, I asked entrepreneur and venture capitalist Dmitry Grishin to talk to us about how he manages risk in his global investment company Grishin Robotics. How would you define high-risk, high-reward robotics from an investor’s perspective? I don’t look at companies in terms of ‘this is high risk’ and ‘this is low risk’. I have a different approach: I try to find a company where I believe in what they’re doing, where I believe in the founders, and I really believe that this company can be a great success. I like to look at it from a pragmatic perspective, so first I want to know what kind of practical problem the company wants to solve. Second, I want to understand the market, because inside robotics you have a lot of smaller markets … telepresence, home automation, security, etc. So I want to know how big this market is. And of course, very critical for me is the team: how it’s organized, what’s the background of the founders, and how they work together. You say that teams are really important. How much does a founder’s personality or reputation factor into how you perceive the investment risk? In my experience founding an Internet company, I learned that you definitely have to have a person who understands technology: it’s very critical that one of the founders understands how to build robots and how the technology works. But I find that the best combination is to have two people: one who is more technical, and another who is more of a strategic marketing, sales and product kind of person. It’s rare to find these two kinds of skills in one person. A lot of the time, when technology people start companies, they’re very excited about the technology but they pretty much don’t know what to do with it. They say, ‘We have some super cool technology,’ but when you ask, ‘How do you want to build your business? What’s your plan?’ they don’t know the answer. Unfortunately this problem is very common. If people are missing some of these skills, do you see it as your role to provide some aspect of that in terms of mentorship? Or do you expect the companies that you invest in to already have those skills in place? I can definitely help with experience and help explain the market, but I don’t want to be the leading guy … if an investor starts to manage the company, it’s just a road to nowhere. I try to find the companies that already have those skills in place, or that at least have the potential to go there, because I think these skills are critical. If within the company you don’t already have product DNA or a good understanding of the customer, for example, it’s very difficult to create this culture from the outside. I can definitely help with experience and help explain the market, but I don’t want to be the leading guy. I don’t want to tell people what to do. I’m available to entrepreneurs to answer their questions and give some advice, but it should be their decision in the end. It’s only the way you can build a good company. I think that if an investor starts to manage the company, it’s just a road to nowhere. So essentially what you’re saying is that, even if the market is perhaps more risky, you might be willing to invest in a company as long as the right team is in place, if they’ve got all the skill sets, and the right product to solve a problem. Is that correct? Yes, but it’s also important that I personally believe in this market. For example, in the early days of the Internet, nobody understood exactly how it worked, or what businesses there would be around it, but there was a group of people who really believed that the Internet would one day be a big business and make a big impact. The same is for me. I really believe in robotics in general, and particularly in several markets inside of robotics. Of course there are still lots of questions in terms of how exactly it will work, and what kinds of business models will be successful, but I definitely think the robotics market will be very big – and what’s more interesting – that it will solve a lot of problems for human beings. What are the robotics markets that you really believe in right now? I really do believe in telepresence, but of course this market is in a very early stage, and the companies involved here need to prove that they can find the right products and the right audience for these products. Would you say that some markets in robotics are more risky than others at the moment? Yes absolutely. There are definitely already some more established markets, like vacuum cleaners, for example … the market is already there and everybody understands that you can sell a vacuum cleaner to a customer. But of course you already have players there: iRobot, Samsung and LG entering this market, and a lot of Chinese companies as well. On the other side, you have something like telepresence. We know that police and military organizations are already buying a lot of this, so it’s wanted, there’s a market. But it’s less predictable in the consumer market because it’s at such an early stage. You tend to invest in more mature consumer robotics and not so much in moonshots. Is this because there’s a lack of well-considered moonshot proposals out there to choose from, or are you just not interested in those kinds of projects? First of all, I think mature is not the right word for the companies that I’m investing in. I think of mature as a public company that has a big valuation. If you ask me whether I’m going to invest in a very early stage, the answer is no. I want to invest in a company that already has some kind of prototype … If you want to try to start something, you really need to invest at least a small amount of money yourself, or have some kind of support from your friends or family, or from a source like Kickstarter … because if a team is successful at building some kind of prototype and is able to get some sales from it, it’s a sign that the team has the experience to take a concept to a first project, and this is an important criteria for me. Can you tell us about any particular robotics technologies that you would classify as being especially visionary or innovative? I think there are two kinds of innovation: one where you create something absolutely unusual, and another where a product already exists but you figure out how to bring it to the level where millions of people can use it. An example of this second kind of innovation is the iPhone: touch screens existed before, smart phones existed before, but Apple created a product that millions of people started to use, and this kind of innovation is no less important than the innovation of inventing something new. But if you’re asking about absolutely new directions that have very high risk and yet are potentially very promising, I see the space market as one very interesting area. Satellites, for example, are getting very cheap to make and though they are very high risk, I find them very promising. I also think that anything related to robotic cars is a very interesting market for investing, and yet very high risk because there still needs to be significant innovation to bring these technologies to the market. Drones can also be in this category. Is resistance to adopt these technologies on the part of the consumers a part of what makes them risky? I think there’s a lot of resistance, and infrastructure and people’s minds change slowly at first. But once some level of change has been achieved, adaptation happens very quickly. If you look at the first cars or railroads, we initially saw very slow adaptation, but then the adaptation accelerated. Anytime we are thinking about a robotic product that involves a lot of people and infrastructure, we should be thinking about hybrid models. My belief is that robotic cars will repeat pretty much the same route as hybrid cars, where we spent ten years using electric and gas cars together before there was some kind of visible market share. And this is not just an example, it’s a model we should be using: anytime we are thinking about a robotic product that involves a lot of people and infrastructure, we should be thinking about hybrid models. Mercedes Benz, for example, introduced a car that can park itself, but you still need a person to drive the car. I think the two technologies – self-driving cars and cars driven by people – will live together for quite some period of time, maybe ten or twenty years before they merge together. In the Robots Podcast interview from last November you said that a lot of people have good ideas, but the time isn’t always right for investment. Is there a right time to invest in higher risk initiatives? Is now a good time? Definitely right now is the right time for the robotics market in general, and I really believe that the biggest innovations will be done first by startups. With robotics, it’s not just software, it’s also hardware, and ten or twenty years ago it was almost impossible for a small startup company in robotics to get going because it was too expensive. But now electronic components for robots are really cheap, and 3D printers help a lot with prototypes … so you can have a team of three to five engineers working on a product, and then they can change it based on feedback from users in a test market. The whole process of product development is accelerated significantly. Do you have a message for young entrepreneurs and students out there who are getting ready to enter the robotics market? Right now you have an opportunity that didn’t exist ten or twenty years ago. Right now you can start a robotics company, and the market you create will be able to change people’s lives. I want you to think about this: if you have a good idea and a good team, come to us and we’ll try to help. Just focus on what kind of problem you are solving – not the technology – and think about your team very deeply, because the people with whom you co-found will be very important for your future success.